Experts welcomed the news that the income growth gap between rich and poor has narrowed in the past five years but also questioned the extent to which the lowest-income earners are better off. The four economists and four Members of Parliament were responding to the latest Household Expenditure Survey, released on Thursday. It found that average monthly household income went up from 2008 to last year, with the bottom fifth experiencing the fastest pace of growth. But the observers said the higher cost of living may have dampened the effect of higher incomes. The bottom fifth of households saw average monthly incomes rise by 6.6 per cent a year over the five-year period, while inflation was 3.1 per cent a year on average. DBS economist Irvin Seah said: "Their increase in average household income in terms of purchasing power is significantly less than what the 6.6 per cent growth figure suggests." 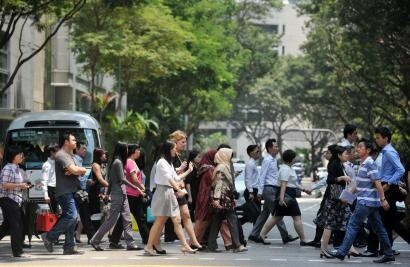 UniSIM economist Randolph Tan said: "The bad news is that the low income are still the most badly hit by price rises." The survey also found that the bottom fifth of households still spend more than their regular take-home pay. Households in this group earned $2,022 a month on average, but spent $2,231. But the gap between expenditure and incomes has narrowed from five years ago, the Department of Statistics said, adding that households may have other sources of income not reflected in the survey, such as from property sales or lump-sum Central Provident Fund withdrawals. Mr Seah said the gap between income and expenditure could be because more in the lower income group are retired, and spending more on needs like health care. Ang Mo Kio GRC MP Inderjit Singh said that if the higher expenditure was due to higher prices of basic items, instead of spending on pricier items, then he was worried that "inflation will negate rising income levels unless wages can rise even faster". But improvements to the incomes of the poor have been significant, driven almost entirely by government transfers, said the economists and MPs. For one- and two-room households, the average annual income per member was matched nearly dollar for dollar by government transfers like GST Vouchers and the Workfare Income Supplement. Barclays economist Leong Wai Ho said: "We might be finally starting to reverse the widening of the income gap." But it may not be sustainable to rely indefinitely on transfers to further improve the lot of the lower income as that requires strong economic growth to generate revenue, said the experts. Chua Chu Kang GRC MP Zaqy Mohamad said: "The last thing you want is for everyone to have expectations that the Government will always step in and fill the gap when workers have low pay." Instead, the focus should be on growing real wages, said Bank of America Merrill Lynch economist Chua Hak Bin, Nanyang Technological University economist Walter Theseira and Pasir Ris-Punggol GRC MP Zainal Sapari. "It's best to look at subsidies and transfers as measures to keep households afloat while we look at how to help them be able to earn more," said Dr Theseira. Such measures should include training and upgrading the skills of low-wage workers to raise their pay and give them more opportunities, said Dr Chua and Holland-Bukit Timah GRC MP Liang Eng Hwa.